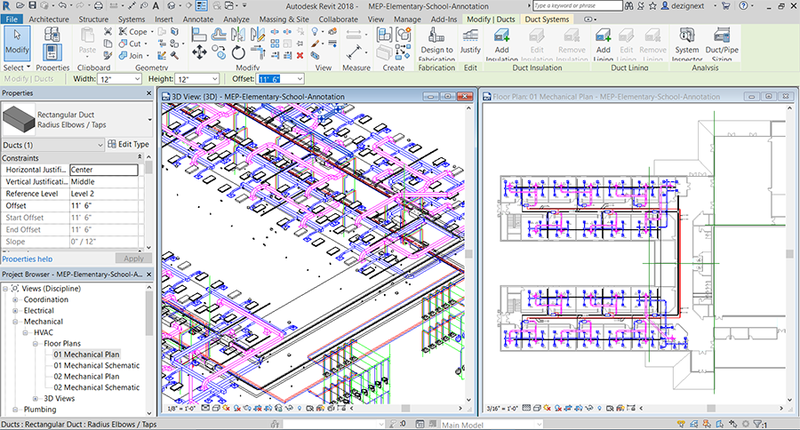 Autodesk Revit is building information modeling software for architects, landscape architects, structural engineers, MEP engineers, designers and contractors developed by Autodesk. It allows users to design a building and structure and its components in 3D, annotate the model with 2D drafting elements, and access building information from the building model's database. Revit is 4D BIM capable with tools to plan and track various stages in the building's life-cycle, from concept to construction and later maintenance and/or demolition. Our Revit Training Classes cover most major Revit releases and includes training in specialized areas including: Architectural, Commercial, Landscaping, MEP, Interior Design, Residential, Steel, Structure designs and AutoCAD Integration. Dezignext Technologies offers organizations in or around your area hands-on-intensive Autodesk Revit training courses and certification classes to empower you with the most recent BIM tools and techniques for accelerating your drafting career. Our certified trainers have years of experience in delivering comprehensive Revit training courses and certification classes to help you achieve high-end skills. Dezignext Technologies provides specialized software certification training and Design services with the most popular 2D/3D Modeling, Audio, CAD, CAM, Graphics, IT, Professional Business, Security and Video Applications that are used in our personal and professional lives on a daily basis. We offer the latest computer training classes and certification programs in an online environment with a LIVE instructor, onsite for a group of individuals at your location, Training Workshop Conference Events and personalized e-learning training along with many design solutions to help you with your product or project design.